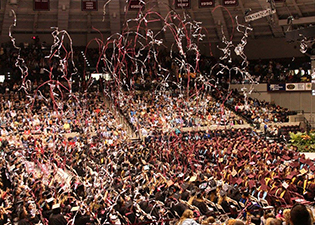 SIU’s May 13 graduation at the SIU Arena marked the end of a successful semester for students. U.S. Rep. Cheri Bustos, D-East Moline, was the keynote speaker at the ceremony for the College of Business and the College of Education and Human Services. Now serving her third term, Bustos has focused on job creation, strengthening the economy and building a stronger middle class. Initially a journalist, Bustos then worked for one of the nation’s largest non-denominational, non-profit health care systems before, during and after the passage of the Affordable Care Act. There, she helped families access affordable health care coverage and worked to improve the quality of health care available in the community. Saturday was a special day for individuals who walked across the stage to receive the degrees that they have worked diligently to earn, and some graduates shared their thoughts about their time in the College of Business. Alan “Jake” Ludlow, of Decatur, graduated with a bachelor’s degree in accounting. Ludlow will begin his professional career in August at Deloitte & Touche, LLP as a technology risk consultant within their advisory department. He credited the College of Business for preparing him for his future career. Britni Harper, of Springfield, graduated with a master’s degree in accountancy. Harper will begin her career in September working with KPMG in St. Louis, Mo. In the meantime, she is studying for her remaining two CPA exams. She said the College of Business helped her prepare for her future career. Ludlow’s advice for younger students came from one of his professors, Marcus Odom, professor of accountancy and Deloitte & Touche Faculty Fellow. Harper also shared some tips for younger students. The graduates also reminisced about what they are going to miss most about SIU. The College of Business wishes the best of luck to all of the students as they graduate and pursue their dreams. Remember: Once a Saluki, Always a Saluki!